Just wanted to bring attention to a new short story by Alice Munro, a famous Canadian short story writer, about the mathematician Sofia Kovalevsky. In only 41 years, this amazing mathematician managed to accomplish a lifetime's worth of goals. Unlike many stories about mathematicians, Too Much Happiness paints a picture of a sane, amiable, and relatable mathematician while relating some of the challenges faced by a pioneer. Check out the short story in the July Harper's Magazine or in her new book of short stories of the name Too Much Happiness. 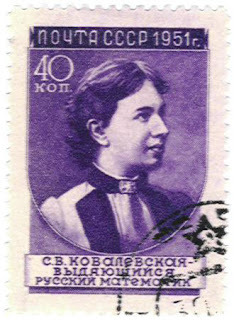 Just a note, the stamp shown was created in her honor by her country during the same time that she was refused any job there. Can you imagine someone who could get their face on a stamp but couldn't find a job? "What's longer: mile or kilometer?" The answer of course is kilometer because if you remove mile from kilometer, you are left with something .... "koter". Unfortunately I did not make this up. I read it in a thread in which the answer to the question in quotes was, believe it or not, hotly debated!